Fifth Third TRIO Credit Card: Is It a Good Value? An excellent credit card for earning rewards at restaurants, gas stations, grocery stores and drugs stores. With no foreign transaction fees, the card is also good for use abroad. The newly released TRIO℠ Credit Card is a strong contender for one of the best cash back credit cards of the year. Though it comes with a $1,500 cap on select shopping categories, it can still provide fantastic savings for the average consumer. The card is best for people who frequently shop at gas stations, restaurants, grocery stores and drug stores. If you tend to spend money at a wider range of merchants, consider other options. How Does the TRIO℠ Credit Card Compare Against Other Cards? Review: Is the TRIO℠ Credit Card Worth Applying For? The TRIO℠ Credit Card qualifies as one of the best credit cards for dining out, especially for low-to-moderate spenders. The card offers an above average, 3%, rewards rate on purchases at restaurants, 2% at gas stations, grocery stores and drug stores, on up t $1,500 per quarter. These are all above-average rates, and better than you get out of most credit cards. The only caveat to this is that $1.5K cap. Before you apply for this card, take an inventory of how far above it you would go. If it’s significant, then you might want to consider applying for a card without such limitations, like the Citi® Double Cash Card. This card also comes with no foreign transaction fees, making it perfect for use when travelling abroad. Other credit cards will typically charge you as much as 3% when you use them outside of the country. Given that this card is also on the Mastercard network, you should not have difficulty finding foreign merchants that accept it. The TRIO℠ Credit Card also provides users a standard suite of features that include things like price protection, and zero liability on fraud purchases. Though these are used in marketing copy for the card, shoppers should know that these can be commonly found on most credit cards out there, and aren’t anything special. Particularly disappointing was this card’s cellphone protection perk. It comes with a fairly low claim limit of $200, and a high $50 deductible. Other banks, like Wells Fargo, give far more generous terms on similar benefits. Bottom Line: The TRIO℠ Credit Card is a solid everyday credit card for low-to-moderate spenders. It’s especially useful for people who tend to eat out a lot, and those who have significant gas, grocery or drug store expenses throughout the year. 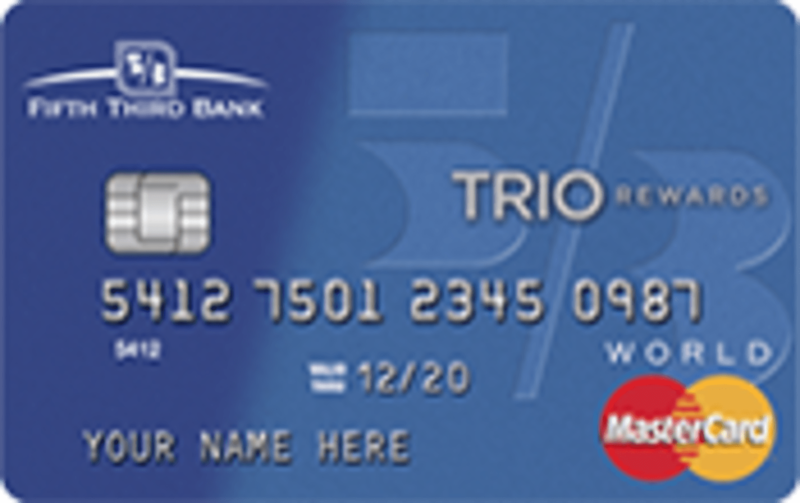 The TRIO℠ Credit Card earns you 3% cash back at restaurants, 2% at gas stations, grocery stores and drug stores, on up to $1,500 spend per quarter in the combined purchase categories. That means if you spend $1,500 dining out and on groceries within two months, for the next month you’ll earn just 1% back at all three merchants – including drug stores. The clock resets every three months, and you get another $1,500 to spend within the bonus categories. Those who use the card optimally, can get anywhere between $30 and $45 extra cash back every three months. Get a $100 bonus after you spend $1,000 within 90 days of opening a new account. Additionally, cardholders can get a $100 bonus if they spend $1,000 on their new credit card within the first 90 days of account opening. Taking out a cash advance or performing a balance transfer do not count towards this $1,000 requirement. The bonus, like all rewards on this card, is earned in the form of points that you can then trade in for cash back. The bank doesn’t specify a minimum amount needed for redemption. Those who charge their wireless phone bill to the TRIO℠ Credit Card can be reimbursed if their device is damaged or stolen. Only phones purchased by the cardholder are covered. The coverage limit on this benefit isn’t as good as the ones we’ve seen offered through other banks, such as Wells Fargo. Fifth Third gives a limit of $200 per claim, and a $400 limit per 12-month period. You also cannot file more than two claims per year. When you submit a claim, you are subject to a $50 deductible. By contrast, Wells Fargo’s cellular telephone protection benefit offers a $600 claim limit, capped at $1,200 per year. The deductible is also significantly lower at $25. That means the consumer is likely to pay less out of pocket in the event something goes wrong. With how expensive smartphones get, replacing or repairing them can easily exceed the $200 offered by Fifth Third. Anyone thinking of this type of benefit as a major selling point should consider this in making his or her decision. How Does the TRIO℠ Credit Card Compare to Other Credit Cards? It’s good to view the TRIO℠ Credit Card in the backdrop of other reward credit cards, to get a better sense of its value. We took a look at some of the most popular options out there and compared the cards below. The Citi® Double Cash Card is the better option for anyone who shops at a variety of merchants. This card offers 1% cash back whenever you make a purchase, and another 1% back when that transaction is paid off. This makes it one of the simplest reward credit cards to use. There is no need to worry about optimizing for categories, or thinking about how to redeem points. The one downside to the Citi® Double Cash Card is that it has no sign-up bonus. Therefore, if you choose to go with this card over the TRIO℠ Credit Card, you will be potentially missing out on an easy $100. It's also worth mentioning that the Citi® Double Cash Card was named as one of this year's top cash back credit cards. The Chase Freedom® has the potential to give significantly better returns to cardholders than the TRIO℠ Credit Card. Users get 5% cash back on categories that rotate each quarter, up to a quarterly maximum of $1,500. Purchases outside of that will earn users just 1% back. Though certain categories repeat year-to-year, there is an element of unpredictability to this card’s reward structure. If you can generally get 25% to 50% of your purchases throughout the year to fall into one of these bonus buckets, you’ll be coming out ahead with the Chase Freedom®. Otherwise, if this type of uncertainty bothers you, and you rather have a consistent and fixed rewards program, you should go with the TRIO℠ Credit Card.